Can Johan Santana make it back to the majors with Toronto? 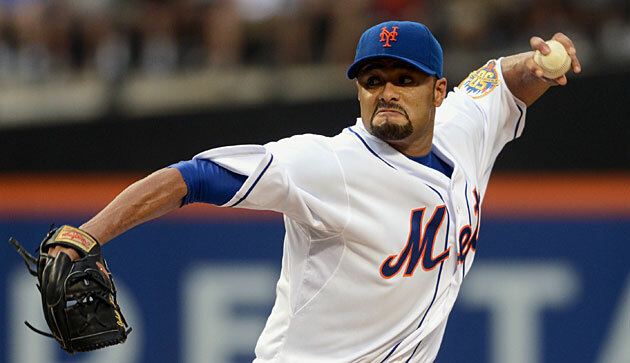 Johan Santana is attempting yet another comeback, this time with the Toronto Blue Jays. Will the two-time AL Cy Young award winner make it back to the Show? Johan Santana is on the comeback trail… again. On Thursday, the two-time AL Cy Young winner, who last pitched in the majors on Aug. 17, 2012, agreed to a minor league deal with the Blue Jays — a team whose pitching received a whole lot less of a facelift this winter than its lineup. Santana turns 36 on March 13, and he is hardly guaranteed to help Toronto given the litany of injuries that have kept him off the mound over the past few years. Still, it's hard to fault the team for making a no-risk move. Santana will earn $2.5 million plus incentives if he's on the major league roster, but it's far from certain that he'll pitch well enough or stay healthy long enough to do so. The Blue Jays, Yankees and Padres were among what was reportedly half a dozen teams interested in taking a flyer on him as of Jan. 20, though the Orioles, with whom he attempted a comeback last season, were not among them. Interest may have cooled since then because after making a perfect two-inning start for the Magallanes Navigators of the Venezuelan Winter League on Jan. 14, Santana was shut down due to shoulder stiffness, and he only restarted his throwing program this week. Santana, who broke in with Minnesota in 2000 after a Rule 5 draft odyssey that took him from the Astros (who signed him at age 16 in 1995) to the Marlins to the Twins, won two AL Cy Young awards and ERA titles (2004 and '06), made three All-Star teams and helped Minnesota to the postseason four times. During that 2004-07 run, he was the best pitcher in baseball, topping the majors with 28.3 Wins Above Replacement (Baseball-Reference.com version) and ranking second with 912 1/3 innings, a 2.89 ERA and a 155 ERA+; in the latter two categories, he trailed only Roger Clemens, who threw 274 1/3 fewer innings in that span. Knowing that they couldn't afford to re-sign him once he reached free agency following the 2008 season, the Twins traded Santana to the Mets for four players on Feb. 2 of that year. As part of the deal, he signed a six-year, $137.5 million extension, one that didn't turn out as planned. His first year in New York was in line with his previous four seasons; he led the NL with a 2.53 ERA and 234 1/3 innings pitched and finished third in the Cy Young balloting. His injury woes began in 2009, though, when he missed the season's final month and a half due to surgery to remove bone chips in his elbow. While he rebounded to make a strong showing in 2010 with a 2.98 ERA in 199 innings, his season again ended with a September surgery, this time for a torn anterior capsule that cost him all of the 2011 season save for two minor league appearances that were five weeks apart. Santana made a triumphant return in 2012, throwing five scoreless innings of two-hit ball against the Braves on Opening Day, spinning a complete-game four-hit shutout of the Padres on May 26 and then throwing the first no-hitter in Mets history on June 2, blanking the Cardinals while throwing 134 pitches. Though he got roughed up in his two subsequent starts, he was scoreless in two of his next three after that, the last of which was an eight-inning, three-hit effort against the Dodgers on June 30 that lowered his ERA to 2.76. Alas, he was battered for at least six runs in each of his five starts after that, his effectiveness reduced first by an ankle sprain that sent him to the disabled list for three weeks and then by lower back inflammation that shut him down for the season in mid-August. He finished the year with a 4.85 ERA in 117 innings. After battling with the Mets brass over the pace of his rehab program the following spring — culminating in a bullpen session thrown without team permission — he was again shut down, initially for recurrent lower back woes. By late March, doctors discovered that he had re-torn the capsule in his shoulder. He underwent surgery on April 2, 2013, his final season under contract with the Mets, who chose to pay his $5.5 million buyout rather than pick up his $25 million option for '14. Johan Santana hasn't pitched in the majors since 2012 and hasn't made 30 starts since 2008. Santana didn't pitch in the majors or minors in 2013, and as a free agent for the first time in his career, he eventually signed an incentive-laden minor league deal with the Orioles on March 4, 2014. He worked his way through the typical rehab progression, throwing batting practice, simulated games and extended spring training games, with his velocity reportedly reaching the high 80s. With an opt-out date in his minor league deal approaching, Baltimore selected his contract and put him on the big league disabled list with an eye toward activating him on June 19. On June 6, during an extended spring training game in which he was scheduled to throw 75 pitches, he tore his left Achilles. Just 33 pitches into the outing, he was hit by a line drive, stumbled while picking up the ball and limped off the field with assistance. He soon underwent his fourth season-ending surgery in six years. That injury history, which has limited Santana to just 125 competitive innings over the past four seasons, makes him a longshot to provide substantial help to any major league team. The Blue Jays, however, appear to be a team where a need could exist. Their 4.23 runs allowed per game last year ranked ninth in the AL, with their starters (3.96 ERA, 11th) and relievers (4.09 ERA, ninth) subpar. Over the winter, Toronto shed starter J.A. Happ, closer Casey Jansen, relievers Dustin McGowan, Brandon Morrow and Sergio Santos, and prospects Sean Nolin and Kendall Graveman — a group that accounted for 40 starts, 31 of the team's 45 saves, and 300 total innings. While the Jays made headlines with the free agent signing of catcher Russell Martin and the blockbuster trade centered around third basemen Josh Donaldson and Brett Lawrie, their most substantial addition to the pitching staff this winter was Marco Estrada, who was acquired from the Brewers in the Adam Lind deal; Estrada is coming off a season in which he was tagged for a 4.39 ERA in 150 2/3 innings, struggling as a starter but pitching reasonably well in relief. Barring a bigger acquisition this spring, Toronto is counting on well-regarded youngsters Marcus Stroman and Aaron Sanchez to round out the rotation behind Mark Buehrle, R.A. Dickey and Drew Hutchison. The 23-year-old Stroman made a solid 2014 showing in 20 starts and six relief appearances totaling 130 2/3 innings, while the 22-year-old Sanchez posted a 1.09 ERA in 33 innings last year, all of them out of the bullpen. The latter is considered either the team's best or second-best prospect by those in the business of ranking such things. Based on his potential for three plus pitches, Sanchez's ceiling is as a number two starter, but significant mechanical woes can compromise the consistency of his fastball, leading some to believe he's better off in the bullpen. Daniel Norris, the other pitcher vying for top prospect consideration, is a 21-year-old lefty (22 on April 25) who made one start and four appearances for the big club, but he otherwise has just 58 1/3 innings above High A, meaning that he’ll likely need more minor league seasoning. All of which is to say that it's not out of the question that the Blue Jays could require a stopgap fifth starter, or — with southpaws Brett Cecil penciled in as closer and Aaron Loup as a setup man — a lefty middle reliever. That's not exactly the sexiest role for Santana no matter how many Cy Youngs he has under his belt, but even making it back to the majors would count as a significant triumph for a pitcher who's been absent for so long. It may not work out, but you can’t fault the Jays — ​or Santana — ​for trying.